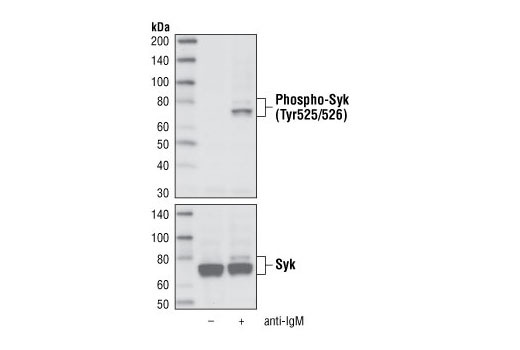 Phospho-Syk (Tyr525/526) (C87C1) Rabbit mAb detects endogenous levels of Syk protein only when phosphorylated at Tyr525/526 of human Syk or Tyr519/520 of mouse Syk. It also detects Syk protein when singly phosphorylated at Tyr526 of human Syk or Tyr520 of mouse Syk. It does not cross-react with other tyrosine-phosphorylated protein tyrosine kinases. 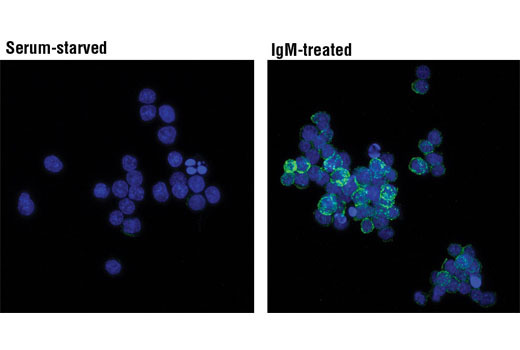 Monoclonal antibody is produced by immunizing animals with a synthetic phosphopeptide corresponding to residues surrounding Tyr525/526 of human Syk. Syk is a protein tyrosine kinase that plays an important role in intracellular signal transduction in hematopoietic cells (1-3). Syk interacts with immunoreceptor tyrosine-based activation motifs (ITAMs) located in the cytoplasmic domains of immune receptors (4). It couples the activated immunoreceptors to downstream signaling events that mediate diverse cellular responses, including proliferation, differentiation, and phagocytosis (4). There is also evidence of a role for Syk in nonimmune cells and investigators have indicated that Syk is a potential tumor suppressor in human breast carcinomas (5). Tyr323 is a negative regulatory phosphorylation site within the SH2-kinase linker region in Syk. Phosphorylation at Tyr323 provides a direct binding site for the TKB domain of Cbl (6,7). Tyr352 of Syk is involved in the association of PLCγ1 (8). Tyr525 and Tyr526 are located in the activation loop of the Syk kinase domain; phosphorylation at Tyr525/526 of human Syk (equivalent to Tyr519/520 of mouse Syk) is essential for Syk function (9). Deckert, M. et al. (1998) J Biol Chem 273, 8867-74. Rao, N. et al. (2001) EMBO J 20, 7085-95. Law, C.L. et al. (1996) Mol Cell Biol 16, 1305-15.